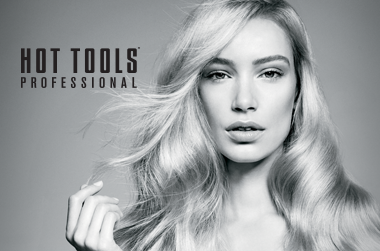 Experience the difference of professional styling tools with Hot Tools. Designed for and with hair industry professionals, the Hot Tools range of curling wands and flat irons delivers salon-quality results at home. Leading the way in hair styling innovations for over 25 years in the USA, this award-winning range is now available in Australia. From the uniquely designed ergonomic Curl Bar to the friction-free Flat Iron, the Hot Tools range has something to help create any hair style. What sets Hot Tools apart? Each Hot Tools product has been carefully designed to meet the most rigorous demands of hair styling, whether in the salon, on a film shoot, or backstage at a runway show. Developed in conjunction with professional hair stylists, Hot Tools combines innovations in materials, technical features and ergonomic designs to help stylists be at their creative best. The star product in the Hot Tools range is the Curl Bar, an ergonomically designed curling wand that reduces strain on elbows, wrists and shoulders. With a ground-breaking 90° angle design, curling hair is fast, easy and more comfortable than ever before. Each Hot Tools styler features the highest quality materials to deliver the very best results. Whether curling, straightening or creating volume, Hot Tools is designed to give a flawless result every time. 24k Gold plates and bars ensure that heat is evenly conducted throughout, for a well-defined, long-lasting finish and healthy, shiny hair. Pulse Technology ensures that every tool heats up quickly and stays hot throughout, for fuss-free styling. Preferred by stylists around the world, Hot Tools combines cutting-edge technology, ground-breaking designs and hair industry expertise for an affordable range of heat styling tools that delivers flawless results time after time. Hot Tools is available only for shipping within Australia. I have had my old straightener for several years and just got used to dragging it through my hair. This iron is so smooth I had to relearn how to hold it! It's heats up so fast and has a hand two light system: blue when the power is on or heating up and green when it has reached your set temperature. The default temperature of 200 degrees works well for my fine hair, but it can go higher (the highest I went was 220). The device feels a bit lighter than the Cloud Nine and the plates feel a bit thinner, which makes it very easy to curl hair with.